Different levels in side supports makes it easy to hold items of different size inside case! 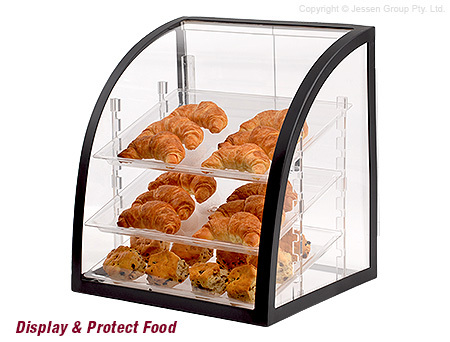 An acrylic bakery case, like a countertop restaurant display or pastry cabinet, is a great way to show baked goods at your business so customers can easily choose which to purchase. The display is made from 5mm thick clear acrylic so that seeing inside the case is easy from all angles. An steel frame with a black finish around the cabinet offers a sleek look that works well in any bakery, bistro, restaurant, or cafe. This plastic pastry cabinet, acrylic bakery case is a tiered display, with the cabinet only 415 x 390mm to take up little space on your countertop but still have plenty of space for goods. You place your items on the (3) included polycarbonate food grade safe trays. The tiered display allows items of different size be used within, and the top tray may be angled to show a better view of items. Accessing the interior is achieved through the (2) swing doors on the back that help keep contaminates out of your food while in the case.